Once upon a time there was a little boy whose name was Tommy. As a matter of fact his name was Tobias Theodore; the former because it was an old name in the family, and the latter because it was an entirely new name in the neighbourhood. It is to be hoped that the parents who called him Tobias Theodore, moved by a natural desire to keep it quiet, agreed to call him Timmy; and anyhow we will agree to call him Tommy. It is always assumed in stories that Timmy is a common name for a boy; just as it is always assumed that Tomkins is a common name for a man. I do not really know very many boys named Tommy. I do not know any man named Tomkins. Do you? Does anybody? But this enquiry would lead us far. Anyhow Tommy was sitting one very hot afternoon on a green lawn outside the cottage that his father and mother had taken in the country. The cottage had a bare white-washed wall; and at that moment it seemed to Tommy very bare. The summer sky was of a blank blue, which at that moment seemed to him very blank. The dull yellow thatch looked very dull and rather dusty; and the row of flower-pots in front of him, with red flowers in them, looked irritatingly straight, so that he wanted to knock some of them over like ninepins. Even the grass around him moved him only to pluck it up in a vicious way; almost as if he were wicked enough to wish it was his sister’s hair. Only he had no sister; and indeed no brothers. He was an only child and that moment rather a lonely child, which is not necessarily the same thing. For Tommy, on that hot and empty afternoon, was in that state of mind in which grown-up people go away and write books about their view of the whole world, and stories about what it is like to be married, and plays about the important problems of modern times. Tommy, being only ten years old, was not able to do harm on this large and handsome scale. So he continued to pull out the grass like the green hair of an imaginary sister, when he was surprised to hear a stir and a step behind him, on the side of the garden far away from the garden gate. He saw walking towards him a rather strange-looking young man wearing blue spectacles. He was clad in a suit of such very light grey that it looked almost white in the strong sunlight; and he had long loose hair of such very light or faint yellow that the hair might almost have been white as well as the clothes. He had a large limp straw hat to shade him from the sun; and, presumably for the same purpose, he flourished in his left hand a Japanese parasol of a bright peacock green. Tommy had no idea of how he had come onto that side of the garden; but it appeared most probable that he had jumped over the hedge. Tommy did not answer and perhaps did not understand; but the strange young man proceeded with great composure to take off his blue spectacles. Tommy was moved to a mild curiosity and peered through the glasses; there certainly was something weird an quaint about the discoloration of everything; the red roses black and the white wall blue, and the grass bluish green like the plumes of a peacock. „Yes,“ said Tommy and put the spectacles down with a rather puzzled air. Then his expression changed to surprise; for the extraordinary young man had put on another pair of spectacles, and this time they were red. Tommy tried the spectacles, and was quite startled by the effect; it looked as if the whole world were on fire. The sky was of a glowing or rather glaring purple, and the roses were not so much red as red-hot. He took off the glasses almost in alarm, only to note that the young man’s immovable countenance was now adorned with yellow spectacles. By the time that these had been followed by green spectacles, Tommy thought he had been looking at four totally different landscapes. Tommy was staring up at him with round eyes. „Who are you?“ he asked suddenly. „But I haven’t got a brother,“ objected Tommy. „When you were a little boy like me?“ asked Tommy with some reviving interest. „Why, how do you know I felt like that?“ asked the little boy, who was rather frightened. „Why, because I felt like that myself,“ said the other with a smile. Then after a pause he went on. „Were there any people in that country?“ enquired Tommy. „You must have been frightened,“ said the little boy. „What are blue-stockings?“ asked Tommy. „What did you find out?“ asked Tommy, who was beginning to listen much more attentively. „You may have heard,“ said the young man, „a very vulgar expression about painting the town red. It is more probable that you have heard the same thought put in a more refined form by a very scholarly poet who wrote about a rose-red city, half as old as time. Well, do you know, it is a curious fact that in a rose-red city you cannot really see any roses. Everything is a great deal too red. Your eye are tired until it might just as well all be brown. After I had been walking for ten minutes on scarlet grass under a scarlet sky and scarlet trees, I called out in a loud voice, ‚Oh, this is all a mistake.‘ And the moment I had said that the whole red vision vanished; and I found myself standing in quite a different sort of place; and opposite me was my old friend the Wizard, whose face and long rolling beard were all one sort of colourless colour like ivory, but his eyes of a colourless blinding brilliance like diamonds. „And the I looked round me at the place to which he had brought me; and a very curious place it was. It lay in great ranges of mountains, in layers of different colours; and it looked something like sunset clouds turned solid and something like those maps that mark geological soils, grown gigantic. And all along the terraces of the hills they were trenched and hollowed into great quarries; and I think I understood without being told that this was the great original place from which all the colours came, like the paint-box of creation. But the most curious thing of all was that right in front of me there was a huge chasm in the hills that opened into sheer blank daylight. At least sometimes I thought it was a blank and sometimes a sort of wall made of frozen light or air and sometimes a sort of tank or tower of clear water; but anyhow the curios thing about it was that if you splashed some of the coloured earths upon it, they remained where you had thrown them, as a bird hangs in the air. And there the Wizard told me, rather impatiently, to make what sort of world I liked for myself, for he was sick of my grumbling at everything. And with that he turned so sharply that Tommy had not time to turn and see him jump over the hedge; for Tommy remained staring at the cottage, with a new look in his eyes. — Was ich an dieser Geschichte mag, wie auch an vielen anderen Chesterton-Texten, ist die Ehrfurcht vor der Schöpfung und das Staunen darüber. Und dass wir selber Schöpfer sind. Mit diesem Gedanken können auch Atheisten wie ich sehr gut leben. Vielleicht sollte ich ergänzen, dass es etwa drei Menschen gibt, die mich „Tommy“ nennen, soweit ich weiß. It is one thing to describe an interview with a gorgon or a griffin, a creature who does not exist. 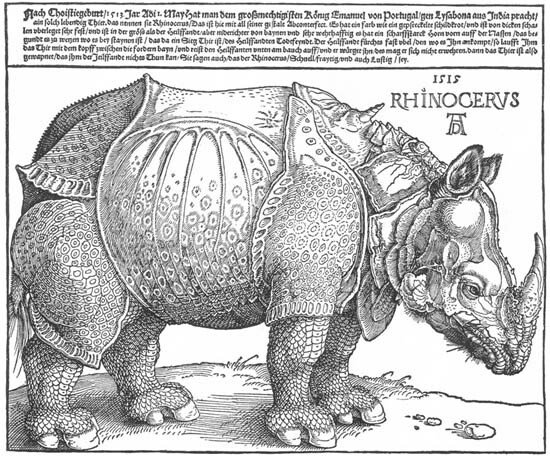 It is another thing to discover that the rhinoceros does exist and then take pleasure in the fact that he looks as if he didn’t. Ich mag phantastische Literatur. Wegen des Eskapismus, der Zugänglichkeit, Prägung in der Jugend, warum auch immer. Das Staunen, der sense of wonder – ein Science-Fiction-Fans wohlbekannter Begriff – führte zumindest bei mir dazu, dass ich nicht nur über Irreales staune, sondern auch über unsere wirkliche Welt. Stell dir vor, es gebe keine Nashörner. Was wären sie dann für eine phantastische Erfindung, mindestens so phantastisch wie Drachen und Einhörner. Und jetzt die Überraschung: Es gibt sie tatsächlich. Das ist kein Grund, weniger über sie zu staunen. Und wo ich gerade dabei bin, biete ich zum Vergleich „The old master painter“ an (Text: Haven Gillespie, Musik: Beasley Smith). Bekannt gemacht wurde das Lied durch Richard Hayes, heute wird es wohl am ehesten mit Frank Sinatra in Verbindung gebracht. Ich kenne es vor allem in der Version von Phil Harris. Parallelen zu Chesterton: Der Topos vom Maler, die vielen Farben, Lob der Schöpfung. Die Tatsache, dass der Maler nicht der christliche Gott ist, da er ja auch das Spitzbübische erschaffen hat. Man möge mir theologische Vereinfachungen verzeihen. Was natürlich fehlt ist die Tatsache, dass bei Chesterton der Mensch selbst zum Pinsel greifen kann. Ohne Musik wirkt der Text nicht ganz so gut. Phil Harris (Baloo der Bär) legt sein ironisches Zwinkern in die Stimme, das Sinatra gar nicht kennt. Dafür ist bei Harris ein grässlicherer Chor im Hintergrund. Wenn Du das Meer gemacht hättest, hättest Du es zahm gemacht? / Wenn Du den Wind gemacht hättest, hättest Du ihn lau gemacht? Ich schlage vor: stewardesses. Das macht man doch mit links. > habe ich ihn mit meinen neu erworbenen Zehnfingerkenntnissen abgetippt. Für stewardesses braucht man aber alle Finger, ich dachte an einen einzigen Finger. In meinem Oulipo-Band wird, wenn ich mich recht erinnere, auch ein Text (Roman?) erwähnt, der nur aus Zeichen der linken Hälfte der Schreibmaschinentastatur besteht. Aber ein längeres als stewardesses finde ich jetzt auch nicht. Tolle Seite, danke! „Ceded“ und „deeded“ sind dort auch. „Yummy“ ist noch schöner, geht aber nur auf der englischen Tastatur. Und überhaupt viel lustiger Kram. Ich freue mich sehr, dass es noch mehr solche Leute gibt, die sich um so etwas Gedanken machen.